1 / 3 — Crew adjusts tension on the wire in preparation to make up deadends. 3 / 3 — Crew grounds wire in preparation to install jumpers. 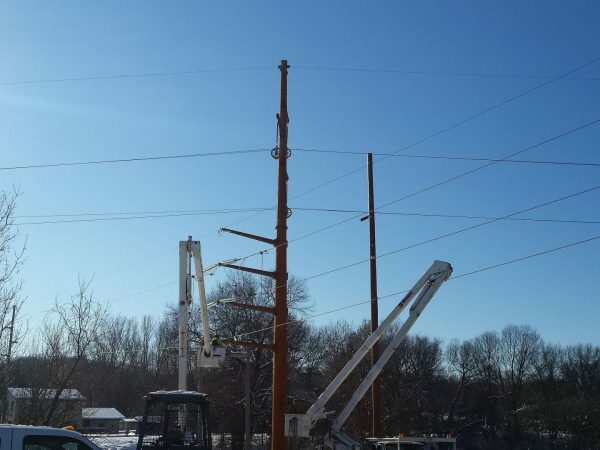 Over a year prior to the start of construction, Hooper Corporation began planning with Dairyland Power for the rebuild of an urban 10.8 mile 161kV line that is double circuit with a 69kV line for a portion of the route running from northern La Crosse through Onalaska. The location of this line now travels though Interstate 90, Highway 53, Highway 16, a high speed railroad corridor, two different golf courses, a large wetland area, a mall parking lot as well as over many homes and businesses. This required a significant amount of planning before any construction actually began in order to minimize the inconvenience to the public. A considerable amount of effort went into creating a work and access plan that organized the sequence, timing, and methodology of construction to reduce the impact on third parties. Some work was completed in the middle of the night to reduce the impact on local businesses. Composite matting was utilized to protect all yards, driveways, parking lots, and archaeological areas. In areas that had been designated as archaeological sites, arrangements were made to have an archaeologist on site while digging. 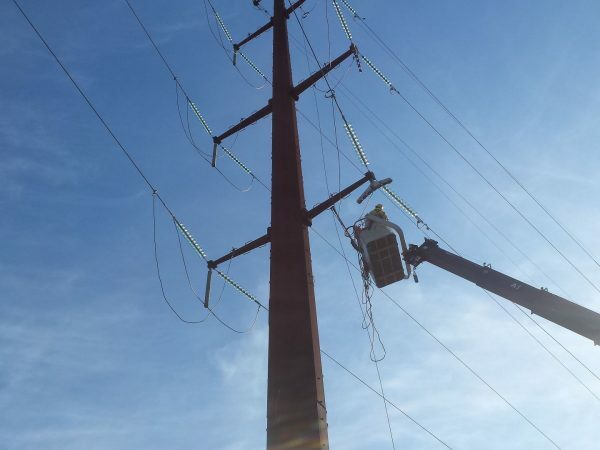 Many working areas were very tight due to the age and location of the existing transmission line. Therefore, each pole piece was offloaded directly from the truck and set rather than assembling the entire structure on the ground and setting it in one piece. Special precautions were made before wire was strung over homes, businesses, and busy roads to ensure the safety of the property owners, the crews, and the general public. The 1950 wooden H-Frame line was rebuilt with steel monopoles. Due to limitations associated with the right of way, the proximity of the line to the La Crosse airport, and the urban congestions, adding structures was not possible and many structures had height limitations. As a result, 3M manufactured 656 KCMIL 26/19 ACCR conductor was selected to replace the old 336 ACSR conductor. The properties of the 3M ACCR conductor allow for the line to maintain proper clearances without adding structures or increasing the height. The line also had an optical ground wire (OPGW) cable owned by Windstream that had to remain live during construction. 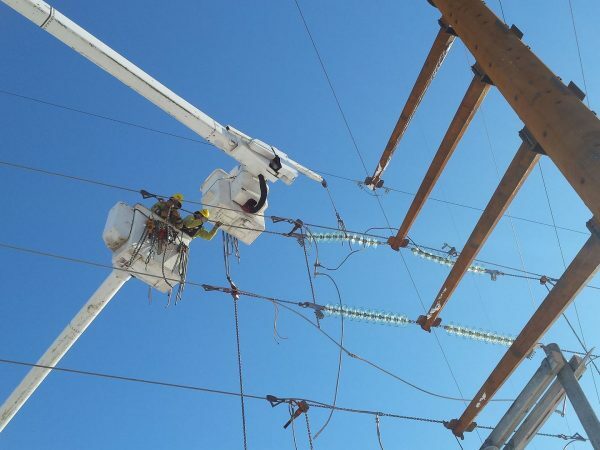 The old OPGW cable was transferred to a temporary position below the conductors on the new poles and remained live until the new OPGW cable was in place. At this time, a midnight outage was taken on the fiber to cut the fiber over from the old cable to the new. The planning and constant daily communication throughout the project between Dairyland and Hooper was integral to minimizing the impacts to those that live and work around the line as well as to the successful completion of the project.